There’s something about the perverse nature of England that the closer we get to the Summer Solstice, the hopeful time when three months of summertime await, the colder and wetter it suddenly seems to become. Except that this year, it couldn’t get much colder. Even at Easter we had snow, and two months later, some blossom trees are only now coming into bud. Ah yes, the weather of 2013 has been ripe fodder for that good old English tradition – talking about the weather. So for this week’s Daily Norm photo of the week, I thought it was only appropriate that I feature a photo I snapped the other day while walking to work in London’s Westminster. Having woken up to gloomy skies and wet pavements, I didn’t think I would be able to enjoy the short stroll I try to make time for each morning by getting off the tube one stop early – it’s a stroll which gives me time to recollect my thoughts before work, and enables me to recover a little composure after the morning’s crush on the tube. Yet just as I was leaving home the sun started to break over damp old London, and 20 minutes later, I took my stroll in the faint morning sunshine, dodging plenty of puddles along the way. 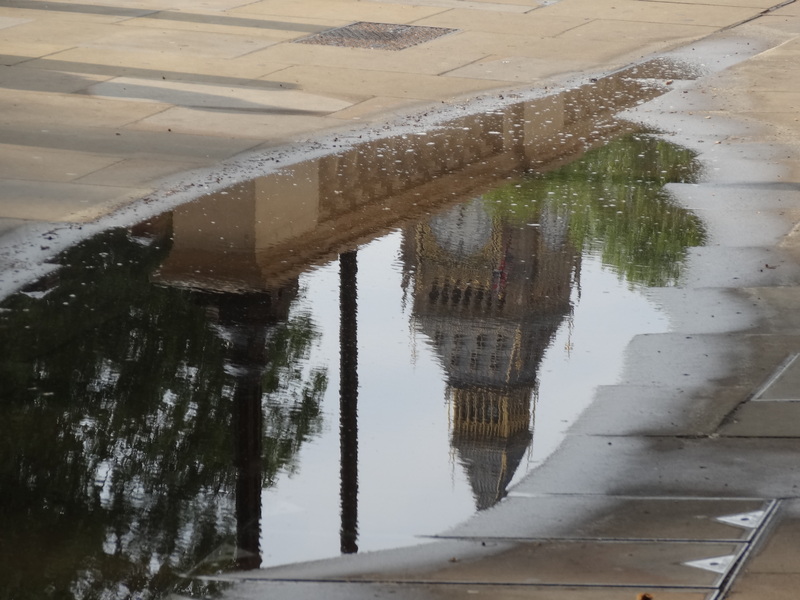 This photo was taken as I passed one such puddle and realised to my delight that London’s most famous landmark, Big Ben (or Elizabeth Tower as we should call it) was reflected perfectly upon the pavement. Grabbing my iphone camera quickly, I managed to capture this shot between commuters rushing moodily by. And for me it’s the perfect illustration of London in June – wet, green, but with a faint, hopeful brightness in the air. Here’s for better weather to come. London concept in an image… I like that.